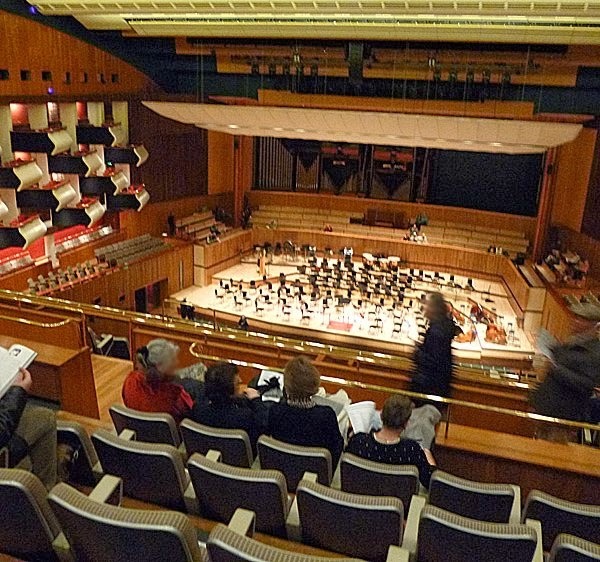 On An Overgrown Path: Why was Marin Alsop's London concert half empty? Why was Marin Alsop's London concert half empty? I have been attending concerts at the Southbank, recitals and orchestral, since 1969. I can attest to the fact the audience composition has changed little in terms of the preponderance of silver hair over that time... But the saddest thing is the sharp decline in total audience size over the last few years. I have seen this in concerts of all types. I was surprised to see a concert with the Suisse Romande Orchestra and Berekovsky in the Grieg Concerto less than half full. Similarly, the recent Berio/Bernstein concert with Marin Alsop and the Sao Paulo Orchestra again was less than half full. The Zimmermann Ecclesiastical Action concert [with Vladimir Jurowski conducting and Ein deutsches Requiem in the second half - Pliable] was less than a third full. These are just a few examples that spring to mind. ... a scene now of squalor, holed carpets, shabby seating, destroyed acoustic due to clutter around thd stage, a once ice-cool sixties now degraded foyer with cheap stud partitioning and a group of untidy usherettes who look as if they just left the night shift at a 24hrs Tescos. still astoundingly poor acoustic of the Festival Hall... The front rows of the circle give a commanding view, but again the sound is distant, unfocused, unclear and dead. The rear stalls is the Lost World of concert going. I am not kidding when I tell you I have been surrounded by people actually sleeping during a concert, one snoring quite audibly and not out of tune with the Schumann symphony that could be heard playing in the distance like a phantom radio programme on the BBC World Service long wave. These comments are directed at a specific London venue and there are fine new halls in Birmingham, Manchester and elsewhere that do not suffer from all these shortcomings. In mitigation the Southbank Centre's Rest Is Noise festival is, arguably, bucking the trend of declining audiences, while there are draft proposals, without a timescale, to refurbish the Queen Elizabeth Hall. But David Murphy also criticises the Royal Festival Hall which was refurbished - including an acoustic makeover in 2007 at a cost of £111 million. So reports of a half-empty Marin Alsop concert in the Royal Festival Hall after all the mass media exposure she received just a few months before at the Last Night of the Proms should sound alarm bells, even if Camargo Guarnieri and Luciano Berio were on the programme. The Association of British Orchestras recently asked a rock music executive to tell them what is wrong with classical music. So I thought it worth giving one of the ABO's paying customers the opportunity to provide an alternative take on how core audience sizes are dropping, how no compensating new audience is emerging despite high profile initiatives, and how the environment - acoustic and ambient - in which the music is presented is being degraded. David Murphy's views may be trenchant, but they are shared. Some years ago I was spending much of my life in the Royal Festival Hall, but now I find few compelling reasons to visit it. Last month was a rare exception when I attended some of the Rest Is Noise festival events. In a post I wrote that "the buzz created by the 'access all areas' festival was certainly impressive". But because I am part of the much despised ageing audience and also because some readers think I complain too much - to which I reply perhaps other bloggers don't complain enough - I thought it best not mention the tawdry feel of the Southbank Centre, which is now more suburban shopping mall than world class concert hall - see photo below of foyer. I am sorry, but asking for carpets without holes is not being elitist, it is being realistic - when that elusive new hip young audience finally arrives it will doubtless demand designer carpets without holes. 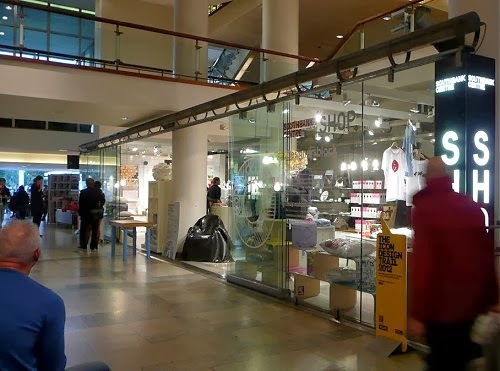 As we walked away from the bustling but tacky Southbank Centre last month my wife and I agreed that it was good to be back, but it would take an awful lot to make us return in the near future. Yes, of course it is the music that matters and the comments quoted above are directed at one London concert venue in particular. (Although, sorry Promers, but the Royal Albert Hall is no better in acoustic or comfort terms). But in the year when we are venerating Benjamin Britten we have conveniently forgotten his wise words that "music... demands some preparation, some effort, a journey to a special place". What David Murphy confirms is that classical music is destroying those 'special places' while, at the same time, congratulating itself on becoming more egalitarian. What is breathtaking is classical music's inability to see the blindingly obvious. How can a celebrity musician be paid $16,5 million a year when classical music is pleading poverty and a major London music venue has a seriously flawed acoustic, threadbare carpets and shabby seating? How can classical music continue to reinvent itself as entertainment when it is obvious that, as a result, its core audience is deserting it without any compensating gain in new audience? Sorry to keep complaining; but the alternative is to join the cultural commentators in lauding today's fashionable condescending classics culture while staying silent about classical music's increasing propensity for self-harm. As I said a few days ago and as David Murphy now confirms, classical music is living in cloud cuckoo land. Also on Facebook and Twitter. Header photo of Royal Festival Hall - which does not show the Marin Alsop/Sao Paulo concert comes ManchesterHistory and footer via Hidden Art. Any copyrighted material on these pages is included as "fair use", for the purpose of study, review or critical analysis only, and will be removed at the request of copyright owner(s). "I am part of the much despised ageing audience..."
As am I, and I wonder if there are a couple of other factors for this particular audience. Example - as I become less young ... all right, older ... I find that I'm becoming more jealous of my time. I'm an hour or so (depending on traffic) from Roy Thomson Hall and the Toronto Symphony. For a concert of 2 hours playing time, that's an investment of 5 hours. When I recently went through the TSO 2013-14 season, there were few concerts that appealed to me in total, and a few others which had one piece of particular interest. I don't seem to be in the target demographic any longer. I don't mean to sound snobbish, but most concert series present a pretty small fraction of the music to which I listen (and much gets repeated fairly frequently). If I want to hear the Beethoven 4th, I'd just as soon pour a glass of time and put on a CD. Takes less time, and I can have a second glass of wine without worrying about driving. Yes, I could have dinner out and make it a more special occasion, but cost begins to be a factor as well as time. Consider the low cost of adding repertoire to play at home, and the picture becomes mpre bleak. Another factor - by now, I have a reasonably formidable selection of LP's and CD's, not to mention the Naxos Music Library. Thanks to advice from my audiophile brother, I have a system which he refers to as "at the low end of the high end." Now, we have close friends who go to more concerts than we do. The difference is that they have not developed an interest in getting set up for good quality reproduction at home (sound reproduction, that is ... they have had some very good quality children). In other words, a night at the TSO is more special for them than it is for us. Our loss? I'm not sure. Does this add up to anything? I don't know. However, there's more recorded repertoire available today at a lower cost than ever before, and good quality sound reproduction is less expensive than ever. It seems to me that those who count on the gray-haired demographic as some sort of reliable bulwark had better pray that most of them resemble the friends I mentioned rather than me. From a selfish perspective, I've never had it so good. However, I don't have to look very far to see some serious storm clouds gathering. The RFH wasn't selling tickets for all sections of the hall for MA's concert. Shame people missed out. It was a great evening. I like that "glass of time" typo, Scott! Professional concerts are simply out of the question for us because of the cost. Since in my opinion no digitized music can ever compare to live, acoustic instruments, we attend local amateur concerts. Affordable and the enthusiasm of the players makes up for the technical flaws that I probably am failing to notice.